Anyone who believes that the people who register our patients, collect insurance information, validate coverage, code encounters, generate claims, manage denials and post payments for the services we provide, are unimportant, doesn’t understand health care. The quality of our facilities, and the number of nurses, technicians, pharmacists, and doctors we have to take care of patients, all depends on how successful our friends working the revenue cycle are at getting us paid for the services we provide. Our revenue cycle caregivers play an important role in customer service as they are often the first people to talk to our patients when they register to be seen, and the last people they speak to when they pay their bill. Last week John Greenwood, the CFO of UMass Memorial Medical Group, and I had the chance to visit our revenue cycle team in the central billing office on Main Street in Worcester. During the visit I met a great group of people who have been working extra hard recently to shorten the time between when we deliver a clinical service and when we get paid for it. This is not an easy job, and as one person said to me, “Getting paid for medical services is incredibly complicated. It’s not like getting an invoice from your plumber – where you write a check and it’s over. It’s often a real struggle to get some insurance companies to pay their portion of the bill and all too often the patient gets stuck in the middle”. 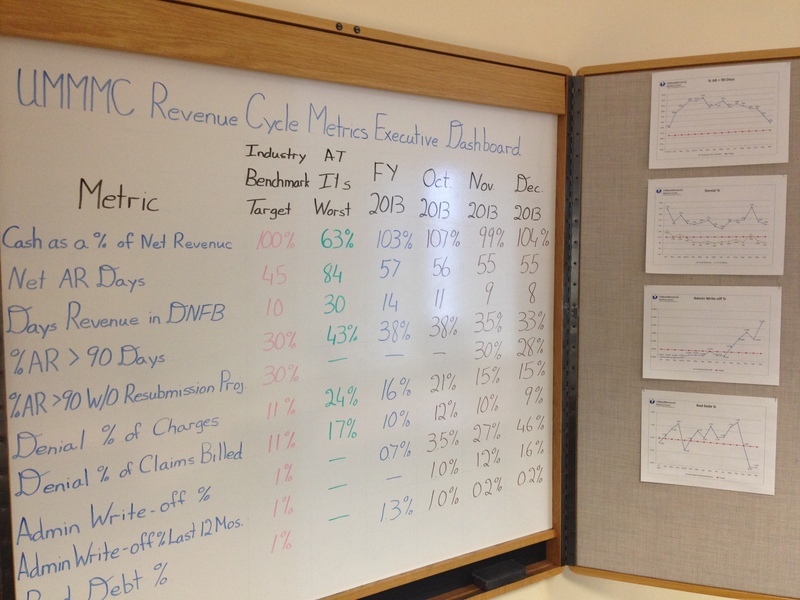 To keep everyone focused on their improvement efforts, the team instituted a visual management system with daily metrics for each key process they are working to improve. Instead of putting lots of numbers up on the wall in small font (I often see this), they focused on just a few metrics and used big scoreboards that you could see from across the room. Fortunately for all of us their work is paying off as is evident by the significant improvement in revenue cycle metrics we have been seeing the last six months. Thanks to everyone on the revenue cycle team for helping us get paid for the services we provide and for everything that you all do to take great care of our patients and one another. Patients are changing insurances frequently and not at fixed times of the year (used to be Jan 1 or July 1). We have been asking to see their card at check in for each visit to facilitate the mandatory prior authorizations we have to complete. PAs are required for some tests and prescriptions. Having the correct insurance information is important in keeping the process lean as well as increasing the chance of getting paid the first time. Being at “the front lines” I agree with the previous comment. Patients so often will tell us “nothing has changed”. We must insist on reviewing their information, since many times there are changes to their demographics and/or insurance coverage. A lot of times we find that active insurances have been dropped from the patient’s billing information, for whatever reason. We spend precious time and effort re-entering this information. I believe this is something that needs to be address. Why this information is dropped, doesn’t appear in IDX, I do not know. I fully agree with this exception. In caring for clinic patients have made a habit of asking each patient for their insurance cards. Our patients generally do not realize they have separate precriptive insurance for example. By doing this I find many MCR patients carry more than one insurance and we do not always have that information in the computer. In streamlining registration this is getting missed and I am sure delays our payment. I would suggest that once a year preferably beginning (due to new insurance cycle) patients have to do a live registration.